The following keynote address was presented at the opening, plenary session of the5th IAASS Conference “A Safe Space for a Safer World”, Versailles, Paris, France, 17-19 October 2011. It is my privilege to attend the fifth International Association for the Advancement of Space Safety Conference and address this distinguished body of scientists and space professionals. 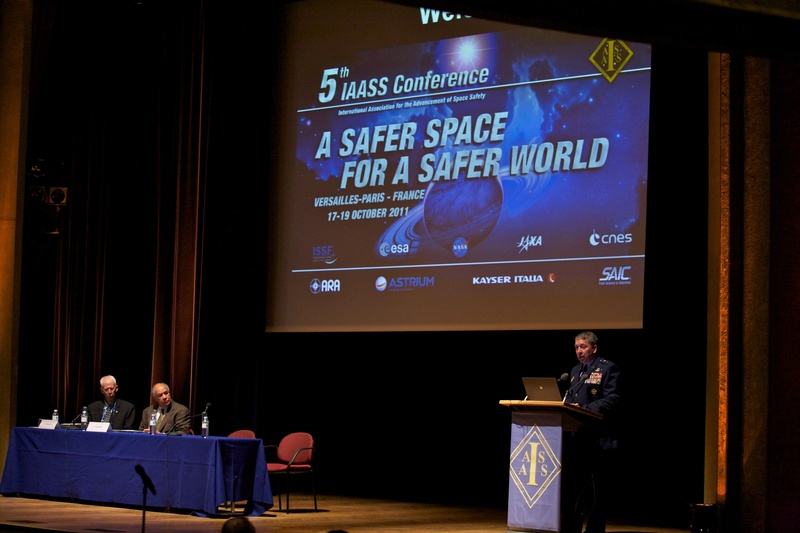 On behalf of the U.S. Air Force and the Air Force Safety Center I’d like to commend the IAASS and its President Mr. Tommaso Sgobba for organizing such an important and dedicated international space safety forum. 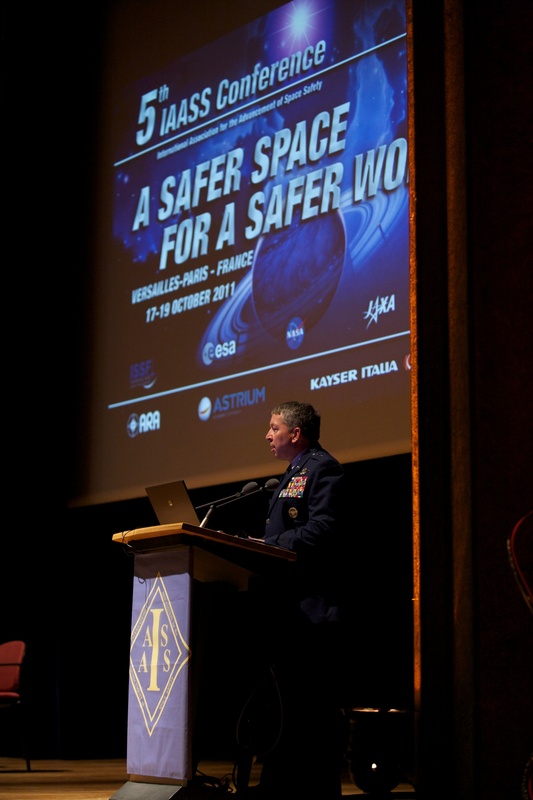 The IAASS has taken measurable strides in promoting space safety awareness worldwide. Safe operation in and through space is one of the main ingredients for economic, commercial and military success. Thank you all for your unwavering and tireless efforts. This week, scientists and the space professionals from all over the world are gathered here to network and address many of the prevailing challenges in the space arena. Many of these challenges are complex, multidisciplinary and culturally varied in nature. They include topics in commercial human spaceflight, space communications and global commerce, space nuclear auxiliary power, space debris mitigation and removal, and environmental remediation just to mention a few. Obviously, many of these challenges are not unique to any particular nation but rather are universal and require international attention and solutions. Recognizing the mere fact that space is not the providence of any particular nation, I am happy to report that the recent release of several important documents by the United States Government including the National Space Policy signed by the President a year ago, the Space Posture Review and National Security Space Strategy issued by U.S. Department of Defense, and the Space Governance Review prepared by the Secretary of the U.S. Air Force. These documents encourage greater collaboration among space-faring nations and the safe and responsible use of space. No doubt, such collaboration and partnership foster increasing benefits to national and global economies, security, international cooperation, scientific discovery, environmental protection and overall quality of life on Earth. I should also highlight the U.S. Air Force’s commitment to space safety. Since the Space Safety Division was created at the Air Force Safety Center in 2004, there have been no personnel injuries or deaths associated with a U.S. Air Force space mishap. We continue to develop space safety policy for the U.S. Air Force and have been working toward many of the same goals I’m speaking about today. In fact, my space safety division who is represented here today has been collaborating and contributing to the aspirations and goals of IAASS since its inception. Maj Gen US AF/SE Gregory A. Feest Opening Speech at the 5th IAASS Conference in Versailles, October 16,2011 (Credits John Conley). As the commercialization of space and human spaceflight flourishes, the IAASS scientific community should endeavor toward the long-term goal of preserving the continued use of space for all future humankind. This forum is uniquely qualified and equipped to effectively develop and socialize scientifically based safety procedures to ensure the continued safety of space missions. A document similar to principles and safety techniques prepared by the International Civil Aviation Organization is a worthy goal, and would harmonize operational procedures to unify and integrate space surveillance and situational awareness guidelines world-wide, just as the ICAO does for the aviation community. I would like to talk briefly about educational part of the space safety. We all are excited to observe this decade commercial human space transportation, and commercial space stations, hybrid vehicles operating as aircraft and spacecraft for suborbital flights, the increasing space launch and re-entry traffic through the shared airspace. Such tremendous growth in space enterprise and the crossover with the aviation discipline demands institutionalising a formal aerospace safety training and education to our space professionals. Clearly , such training is imperative to maintaining safe air and space. the dissemination to aviation of data of common interest such as space weather forecast, and alerts on falling space debris. The safety of the aviation operations in the national and international airspace, the safety of launch, on-orbit and re-entry operations, space debris and the sustainability of the space environment, the integration of space and aviation situational awareness, will require space and aviation professionals with a solid background in system safety engineering, and knowledge of space safety regulations and standards. Unfortunately, today aerospace engineering programs do not provide offer courses in space safety design criteria, methods and safety analyses techniques, space safety regulations and standards. I’d like to commend the IAASS’s and International Space Safety Foundation’s (ISSF) for recognizing this critical void and their efforts to fill this gap. This year in Washington DC ISSF organized the first workshop on creating an academic certificate program in space safety. It is proposed to fill the space/aerospace safety educational gap with an initial Graduate Certificate Program. We all expect that world-known experts from academia, space agencies and industry will contribute as faculty and lecturers for the International Institute Space Safety (IISS)educational programs. Space safety systems engineering must be learned not only by those who will begin a specialist career as safety engineers and managers and will perform risk analyses for various certification from launch to re-entry including space debris and space traffic management, but also by those who will follow a career in space project management, or in aerospace systems engineering and operations. True to our space safety mission imperatives, I’d like to remark I am proud to say that my Space Safety Division at the U.S. Air Force Safety Center is championing these educational efforts as well. With our endorsement and support of two U.S. universities we are already committed to initiate Space Safety programs in conjunction with the already accredited Aerospace and Mechanical Engineering programs next year. Senior Scientists from Space Safety Division contributed to the “Safety Design of Space Operations” textbook to be published by Elsevier in 2012. Finally, let us consider that we are living in an exciting and very challenging phase of deep-space exploration. Therefore, we need to promote the responsible, peaceful and safe use of space. All nations have the right to use and explore space, but this right must be met with responsibility. It is my profound hope that for the greater good of space safety you will come together to collaborate in solving challenges we are facing in space today. Challenges that includeexpected that the outcome of this conference will be an come identify ication of potential areas for international cooperation in space nuclear power, space situational awareness and surveillance, for debris monitoring and removal, environmental remediation monitoring and sustainability. preservation of the space environment This conference should create a collaborative environment among nations, while preserving the national interests of each, and adopt approaches for safe activity in space. It is our obligation and our responsibility to protect this fragile ecosystem called space right for the benefit of future generations. My space safety team will continue to partner with you in this endeavor. I wish you all a productive and enjoyable conference. 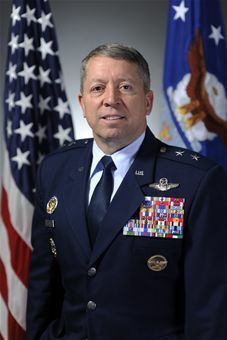 Maj. Gen. Gregory A. Feest is the Air Force Chief of Safety, Headquarters U.S. Air Force, Washington, D.C., and Commander, Air Force Safety Center, Kirtland Air Force Base, New Mexico. He develops, executes and evaluates all Air Force aviation, ground, weapons, space and system mishap prevention, and nuclear surety programs. Additionally, he directs research to promote safety awareness and mishap prevention, oversees mishap investigations, evaluates corrective actions, and ensures implementation. Finally, he manages, develops and directs all Air Force safety and risk management courses. General Feest received his commission through the ROTC program at the University of Wisconsin, Madison, in 1978. Read also “An International Institute for Space Safety“.